Audi Stickers. Wide variety of designs for stickers and stickers for cars and walls.Tuning stickers, racing, wall decoration. Order easily and quickly from our online store. 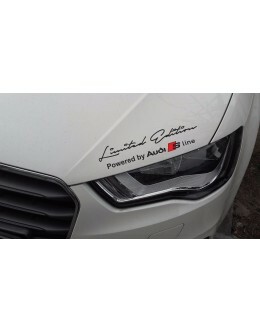 1pair car styling vinyl auto side skirt car sticker Racing stripe decal for Audispecifications and d..
specifications and description:size: 5 1/2" * 3 3/8" ( 14CM * 8.7CM) each quantity: 1..
specifications and description:size: 11 5/16" * 3 3/4" ( 28.8 CM * 9.5 CM) each quantity:&..
specifications and description:size: 320mm x 88mm (12.6" x 3.5") each quantity: 1 set..
specifications and description:size: 350mm x 41mm (13.8" x 1.6")quantity: 2 decalsdefault ..
specifications and description:size: 4.5" x 0.5" (10.43 cm x 1.32 cm) each quantity: ..
specifications and description:size: 19.6 inch wide x ~12.2 inch tall (50cm x 31cm) each q..
specifications and description:size: 23" X 4" (58cm X 10cm) each quantity: 1set of 2 ..
specifications and description:size: 23" X 2.5" (58cm X 6.5cm) each quantity: 1set of..
2 x Limited edition Audi Motorsport Decal Sticker compatible with Audi modelsspecifications and desc..
2 x Limited edition Audi S Line Decal Sticker compatible with Audi S3 S4 S5 S6specifications and des..
specifications and description:size: 260mm x 69mm (10" wide) quantity: 2 decals (left..
specifications and description:size: 4" long x 1/2" high (10cm x 1.3cm) each quantity:&nbs..
Descriptionspecifications and description:size: 1" X 3" (2.5cm X 7.5 cm) each quantity:&nb..
Audi A3 A4 A5 A6 A8 S3 S4 S5 S6 RS4 Q3 Q5 Q7 TT S-Line R8 Quattro HOOD DECALspecifications and descr..